Class I MHC complexes (MHCI) are essential in mediating immune response. The transport of antigenic peptides (TAP) to MHCI and the stable expression of MHCI on the cell surface require the presence of a dedicated TAP. In this study we report that IFN-γ and thrombopoietin (TPO) strongly increase TAP1 protein expression in megakaryocytes, followed by an enhanced expression of MHCI on the cell surface. This expression parallels the enhanced TAP1 promoter activity and TAP1 mRNA expression, which are independent of protein synthesis. We also show that this cytokine-dependent expression of TAP1 transcripts depends on STAT1 and IFN regulatory factor-2 (IRF-2), but not on IRF-1, and provide evidence that IRF-2 constitutively binds to the TAP1 gene promoter and enhances TAP1 promoter activity. We show that IRF-2 forms a complex with STAT1 and the cytokine-responsive region of the TAP1 promoter in any TPO or IFN-γ target cells tested. Interaction of IRF-2 and STAT1 on the promoter depends on the DNA-binding domain of IRF-2. Overall, our data indicate that TPO and IFN-γ activate the expression of TAP1 via a new mechanism that involves functional cooperation between STAT1 and IRF-2 on the TAP1 promoter. Class I MHC complex (MHCI)3 and class II MHC molecules are membrane-bound glycoproteins that fulfill key roles in the immune response by their ability to present antigenic peptides to T lymphocytes (1). MHCI molecules are composed of an H chain and an L chain (β2-microglobulin) and are ubiquitously expressed. They are essential in mediating immune responses against viruses and tumor cells. The class I binding peptides are generally derived from proteins synthesized within the cytoplasm of the cell. They are produced by the multicatalytic protease complex (proteasome) whose cleavage specificity can be altered by the IFN-inducible subunits low molecular weight polypeptide (LMP)2 and LMP7 (2). They are transported into the lumen of the endoplasmic reticulum, where class I MHC molecules fold and mature, by a dedicated transporter of antigenic peptides (TAP; a complex of TAP1 and TAP2), which associates with MHCI H chains (3). The TAP1 and TAP2 heterodimers as well as the peptides provided by the complex of TAP are important for the proper folding, maturation, and efficient cell surface expression of class I MHC molecules (4, 5). Cells that lack TAP1 or TAP2 have selective inability to present intracellular Ags on MHCIs on the cell surface (6, 7). Down-regulation of genes associated with peptide production and transport as well as cell surface expression of class I complexes are common in mouse and human tumors, allowing tumor cells to evade antitumor-associated Ag immunity (8, 9). In contrast, proinflammatory cytokines, such as IFNs and TNF, induce the coordinate expression of structural class I chains and TAP, providing efficient maturation and surface expression of the class I molecules. Transcriptional regulation of MHCI and TAP genes has been analyzed in detail in epithelial and immune cells. The TAP1 gene is regulated by a promoter region that it shares with the LMP2 gene. The region between the two genes, which are transcribed in opposite directions, is only 593 bp (10). Within this regulatory region, five cis-acting elements have been mapped and studied. These are SP-1 and NF-κB binding sites and a combination of two overlapping IFN regulatory factor elements (or IFN consensus sequences (ICS)) and an IFN-γ-activated sequence (GAS) (10, 11, 12, 13). ICSs are the target sites for transcription factors of the IFN regulatory factor (IRF) family that have been implicated in antiviral defense, cell growth, and immune regulation (14). Nine members of the family have been identified. All IRFs share significant homology within their N-terminal DNA-binding domain (DBD), which determines a characteristic DNA binding selectivity for GAAA elements (15, 16). GASs, which exhibit the canonical TTCnnnGAA motif, are target sites for transcription factors of the STAT family that are involved in a variety of biological processes. Tyrosine phosphorylation of the STATs renders them competent for dimerization, nuclear translocation, and DNA binding. Most activities of IFN-γ result from the STAT1-mediated transcriptional response. The NF-κB site of the TAP1 promoter has been shown to be important for the induction of promoter activity after stimulation with TNF-α (10, 11). Data regarding regulation by IFN-γ have been conflicting; some reports concluded that the binding of STAT1 to the TAP1-GAS site was essential, whereas others provided evidence that IRF-1 bound to the ICS was fundamental for the IFN-γ response (11, 17). Thrombopoietin (TPO) is the primary physiological regulator of platelet production; it is a lineage dominant factor affecting megakaryocytopoiesis (18). TPO also acts during early hemopoiesis, regulating hemopoietic stem cell production and function (19), and retroviral transduction of a truncated and constitutively activated TPO-receptor, v-mpl, led to a myeloproliferative syndrome in infected mice (20). TPO is known to favor the megakaryocytic maturation of two human multipotent cell lines, UT7 and F36P, after introduction of an exogenous TPO receptor, as we and others demonstrated (21, 22). With the purpose of identifying genes regulated by TPO, we have set up a subtractive library approach and screened for cDNA selectively expressed upon TPO treatment of UT7-mpl cells. Among the clones selected, we identified the cDNA coding for TAP1. In the present paper we show that megakaryocytes do express important amounts of TAP1. We analyzed and compared the regulation of expression of the TAP1 gene after TPO or IFN-γ treatment. Our results indicate that both cytokines activate the expression of TAP1 mRNA by activating TAP1 promoter through a new mechanism that involves both the presence of DNA-bound IRF-2 and activation of STAT1. The TPO mimetic peptide GW395058 (23) was synthesized by Genosys Biotechnologies. Human rIFN-γ and erythropoietin (EPO) were obtained from Roche; rTPO was provided by Amgen. The following Abs were purchased: anti-IRF-1 and anti-IRF-2 Abs from Santa Cruz Biotechnology; polyclonal anti-STAT1 and monoclonal anti-STAT3 Abs from BD Transduction Laboratories; anti-phosphospecific STAT1(Tyr701) Abs from New England Biolabs; and anti-LMP2 Abs from Affiniti Research Products. Purified mAb 148.3 directed against TAP1 was provided by Dr. P. M. Van Endert (Institute National de la Santé et de la Recherche Médicale, Paris, France) and Dr. R. Tampe (Institute of Biochemistry, Biozentrum Frankfurt, Johann Wolfgang Goethe-University, Frankfurt/Main, Germany) (24). The anti-HLA-A2 BB7.2 and anti-MHC class I W6-32 Abs were purified from hybridoma culture medium. Human UT7-mpl cells were maintained in α-MEM supplemented with 10% FCS and 2 U of EPO/ml as previously described (22). UT7-mpl cells were treated for the appropriate time with either 10 U of human IFN-γ/ml, 10 nM TPO mimetic peptide GW395058, or 100 ng of recombinant cytokine/ml (25, 26). Where indicated, UT7-mpl cells were pretreated for 30 min in the presence of cycloheximide (10 μg/ml; Sigma-Aldrich) before adding TPO or IFN-γ. IRF-1/IRF-2 double-knockout murine embryonic fibroblasts (MEF) were provided by Dr. G. Blanck (Department of Biochemistry and Molecular Biology, University of South Florida, Tampa, FL) with permission from Dr. T. Taniguchi (Department of Immunology, University of Tokyo, Tokyo, Japan). Human K562 cells, HeLa cells, THP-1 cells, 293T cells, and IRF-1−/− IRF-2−/− MEF were all maintained in α-MEM supplemented with 10% FCS and treated for the appropriate time with 10 U of IFN-γ/ml. Umbilical cord blood units from normal full-term deliveries from the Obstetrics Unit of the Hopital Saint-Vincent de Paul were obtained after informed consent of the mothers. Cord bloods were diluted and submitted to Ficoll density gradient. Low density cells were recovered, and CD34+ cells were separated by positive selection using an immunomagnetic procedure (CD34+ isolation kit; Miltenyi Biotec). Cells were cultured in serum-free IMDM (Invitrogen Life Technologies), in the presence of 15% of a commercial mixture of BSA, insulin, and transferrin (BIT 9500; StemCell Technologies) supplemented with stem cell factor (25 ng/ml; Amgen), and TPO (100 ng/ml) to amplify megakaryocyte progenitors, as previously described (27). Cells were incubated at 37°C for 10–12 days. Blood samples from adults were obtained after informed consent was provided by the patients. Cells were submitted to Ficoll density gradient, and low density cells were recovered and diluted in RPMI 1640 medium supplemented with 10% serum. Cells (106/cm2) were maintained in culture flasks for 2 h at 37°C, and nonadherent cells were discarded. After two washes, a cell population enriched in adherent monocytes was collected. The luciferase reporter wild-type TAP1-pGL2 encompassing the whole promoter region between the two initiator codons of LMP-2 and TAP1 as well as the one including the TAP1 promoter fragment (−210, +1) were provided by Dr. D. Johnson (Department of Pathology, Yale University School of Medicine, New Haven, CT) (11). An expression plasmid encoding full length IRF-2 was kindly provided by Dr. J. Wietzerbin (Institut Curie, Paris, France). IRF-2 cDNA sequence was subcloned in the pcDNA3 expression vector. Mutated TAP1 promoter reporter constructs and vectors encoding deletion mutants of IRF-2 were obtained by exchanging appropriate PCR fragments from the wild-type constructs. Total RNA was prepared using TRIzol reagent (Invitrogen Life Technologies). RNA (10 μg) was separated onto 1% agarose denaturing gel and transferred to Hybond-N membranes (Amersham Biosciences). Blots were hybridized with an α-32P-labeled probe corresponding to the human TAP1 coding sequence and subsequently to a GAPDH-labeled probe. Transient transfections of UT7-mpl cells were performed using 10 μg of luciferase reporter plasmid and 1 μg of plasmid Rous sarcoma virus-galactosidase as an internal control, as previously described (25). 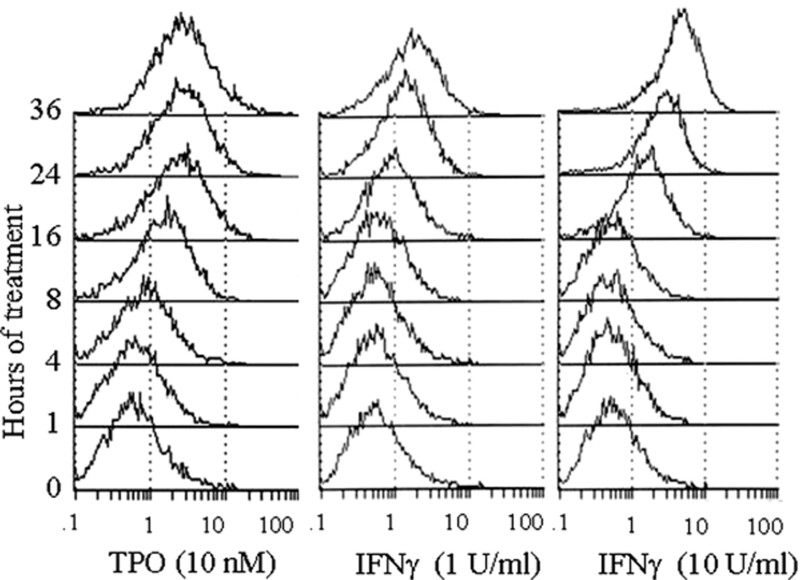 After electroporation, cells were resuspended in proliferative medium and split among three flasks containing TPO (10 nM), IFN-γ (10 U/ml), or no cytokine. Cells were maintained in culture for 15 h before lysis. Luciferase activities were normalized to β-galactosidase activities and expressed as relative luciferase units. Where indicated, expression vectors coding for full-length or truncated versions of IRF-2 were transfected in UT7-mpl cells by electroporation. Cells were maintained in culture for 18–24 h, then incubated with IFN-γ (10 U/ml) or TPO (10 nM) for 0.5–3 h and immediately processed for preparing nuclear extracts. 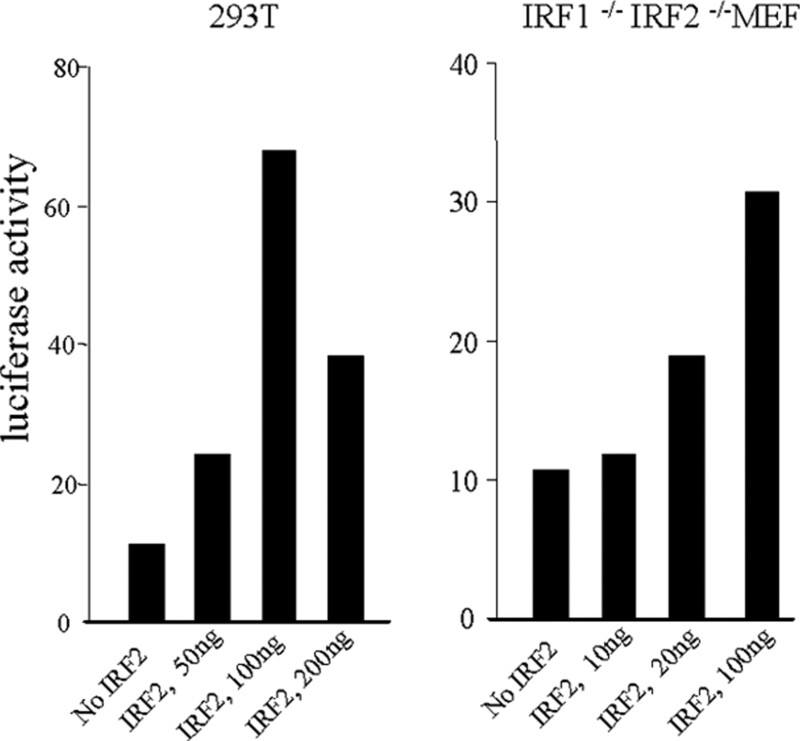 Transfections into either 293T cells or IRF-1−/−IRF-2−/−MEF (2 × 105 cells/experiment) were performed in triplicate with 200 ng of the wild-type TAP1-luciferase reporter construct and varying amounts (0–200 ng) of pcDNA3-IRF-2 expression vector using Lipofectamine (Invitrogen Life Technologies) according to the manufacturer’s instructions. Cells were maintained in culture for 15–18 h, harvested, and processed for luciferase assays. Total cell extracts were prepared by lysing the cells for 30 min at 4°C in Nonidet P-40 buffer (50 mM Tris (pH 7.4), 137 mM NaCl, 1 mM EDTA, 10% glycerol, 1% Nonidet P-40, 1 mM PMSF, 1 mM sodium orthovanadate, 10 μg/ml leupeptin, 10 μg/ml aprotinin, and 1 μg/ml pepstatin) and subsequent centrifugation at 20,000 × g for 15 min. Nuclear extracts were prepared as previously described (25). 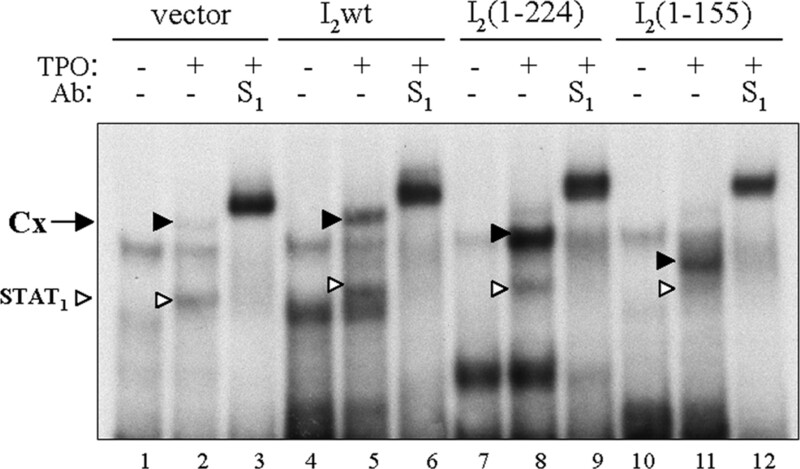 Conventional Western blot analyses were conducted with peroxidase-conjugated anti-mouse or anti-rabbit Abs using chemiluminescence as instructed by the manufacturer (Amersham Biosciences). Cells treated, or not, with TPO or IFN-γ were washed in PBA (PBS containing 0.2% sodium azide and 1% BSA) and preincubated for 30 min at 4°C with 1 mg of normal goat aggregated IgG/ml, then incubated with mouse primary mAbs for 30 min at 4°C and further incubated with FITC-conjugated F(ab′)2 of goat anti-mouse IgG (1/100) for another 30 min. Cells were fixed with 1% formaldehyde and analyzed for fluorescence on an ELITE flow cytometer. For each reaction, nuclear extracts (10 μg) were incubated in binding buffer in ice for 30 min with oligonucleotide probes end-labeled with [γ-32P]ATP and loaded on a 6% nondenaturing polyacrylamide gel as described previously (25). Where indicated, the reaction was allowed to proceed in the presence of a 5- to 100-fold molar excess of unlabeled oligonucleotides or 1 μg of the indicated Abs. The probes used in the EMSAs are listed in Table I⇓. Nuclear extract preparations were always checked for equivalent nuclear extraction by binding on a consensus octamer probe. The multipotent human hemopoietic UT7-mpl cells express exogenous TPO-R and require EPO or GM-CSF for their growth and survival. Upon TPO addition, UT7-mpl cells reduce their proliferative rate and undergo megakaryocytic differentiation (22, 26). A subtractive cDNA library was constructed from RNAs extracted from UT7-mpl cells incubated for 8 h in the presence or the absence of TPO. Among the cDNA selectively expressed, we identified TAP1 as a potential TPO target gene. The expression of TAP1 proteins was analyzed in UT7-mpl cells after TPO treatment. As shown in Fig. 1⇓A, untreated UT7-mpl cells expressed barely detectable levels of TAP1. TAP1 expression strongly increased after 3–6 h of treatment with TPO and reached a plateau at 12–24 h. TAP1 expression similarly increased after IFN-γ addition (Fig. 1⇓B), whereas neither EPO nor GM-CSF enhanced TAP1 in UT7-mpl cells (not shown). In parallel, LMP2 levels were unaffected by the presence of TPO or IFN-γ (Fig. 1⇓, A and B, lower panels). TPO and IFN-γ induce the expression of TAP1 in megakaryocytes. UT7-mpl cells were treated with TPO (A) or IFN-γ (B) for the indicated time, and total cell extracts were prepared. Proteins (100 μg) were analyzed by Western blotting with either anti-TAP1 or anti-LMP2 Abs, as indicated on the right. C, Human megakaryocyte progenitors were selected and amplified from purified cord blood CD34+ by a 10-day ex vivo culture in TPO-containing medium. Cells were then deprived of TPO for 1 day, stimulated for 15 h in the presence of TPO (10 nM) or IFN-γ (100 U/ml), and lysed. Proteins (100 μg) were analyzed by Western blotting using either anti-TAP1 or anti-LMP2 Abs as indicated. We analyzed the expression of TAP1 in normal TPO-responsive cells. Megakaryocyte progenitors were selected and amplified from purified human cord blood CD34+ cells by a 10- to 12-day ex vivo culture in TPO-containing medium, as previously described (27). Cells were next maintained in TPO-deprived medium for 24 h, then stimulated with TPO or IFN-γ. As shown in Fig. 1⇑C, TPO and IFN-γ enhanced the expression of TAP1 in megakaryocytes (upper panel), but none of these cytokines affected the expression of LMP2 (lower panel). The functionality of TPO-induced TAP1 molecules was assessed by testing their capacity to increase cell surface expression of class I MHC molecules. As shown in Fig. 2⇓, TPO enhanced the expression of class I MHC molecules on the surface of UT7-mpl cells. This effect was rapid, being detectable as early as 4 h after addition of the cytokine, in accordance with the kinetics of TAP1 expression. It was detected with Abs that were specific for the monomorphic MHCI determinant (W6/32, not shown) as well as with Abs specific for the A2 determinant expressed by the UT7 cells (BB7.2; Fig. 2⇓). Similarly, IFN-γ enhanced the expression of class I MHC molecules on the surface of UT7-mpl cells, with a magnitude similar to that observed after TPO treatment (left and right panels). TPO and IFN-γ enhance the expression of MHCI proteins on the cell surface. UT7-mpl cells were treated for the indicated time with TPO or IFN-γ. Cell surface expression of the MHCI-A2 determinant complex was analyzed by flow cytometry using the specific mAb BB7.2. Together, these data indicate that TPO enhances the expression of functional TAP1 molecules in a rapid and sustained manner, much as IFN-γ does in the same cell context. We thus analyzed the mechanisms that participated in the TPO/IFN-γ-dependent increase in TAP1 expression in this cellular context. The kinetics of expression of TAP1 mRNA were studied in UT7-mpl cells. Both TPO and IFN-γ induced a similar and rapid accumulation of TAP1 mRNA (Fig. 3⇓, lanes 1–7). This accumulation peaked at 6–10 h, then slowly decreased (data not shown). Such kinetics totally agreed with previous reports on TAP1 mRNA levels in IFN-γ-stimulated epithelial and endothelial cells (11, 28). To decipher the mechanism of TAP1 mRNA induction, we first treated cells in the presence of a protein synthesis inhibitor and tested the consequence of such a treatment on TAP1 mRNA expression. We observed that TPO and IFN-γ both enhanced the expression of TAP1 transcripts regardless of the presence of the protein synthesis inhibitor cycloheximide (lanes 8–15), at a concentration of cycloheximide that totally blocked translation in UT7-mpl cells (see the expression of IRF-1, Fig. 7⇓A). This result indicates that TAP1 mRNA induction by the two cytokines does not require ongoing protein synthesis. TPO and IFN-γ induce a similar accumulation of TAP1 mRNA in the presence and the absence of protein synthesis. UT7-mpl cells were incubated for 30 min at 37°C in the absence (lanes 1–7) or the presence (lanes 8–15) of cycloheximide and further treated for the indicated time with TPO or IFN-γ. Total RNA were isolated and analyzed for the presence of TAP1 or GAPDH mRNA by Northern blot. The activity of the TAP1 gene promoter was then assessed by transient transfection assays, followed by stimulation with TPO or IFN-γ. The 593-bp intergenic sequence between the LMP2 and TAP1 coding sequences was subcloned into the promoterless pGL2 plasmid (Fig. 4⇓A). As shown in Fig. 4⇓B, the activity of the TAP1 promoter was enhanced 9- to 10-fold after TPO (▨) or IFN-γ (▪) treatment, indicating that both cytokines transcriptionally regulated the expression of TAP1. A deletion mutant was constructed encompassing only the first 210 bp upstream of the TAP1 translation initiation codon, because this region is sufficient to promote IFN-γ- and TNF-α-induced TAP1 expression in HeLa cells (11). This deletion mutant was still cytokine-responsive and mediated the TPO and IFN-γ responses of the TAP1 promoter in the UT7-mpl cells (Fig. 4⇓B). TPO and IFN-γ activate the TAP1 promoter. A, Schematic representation of the intergenic sequence between the human TAP1 and LMP2 transcription units. The IRF core binding motifs, TTTC, are indicated in bold. The ICS1, ICS2, and GAS sequences are boxed. Mutations that have been introduced into the various motifs are indicated at the bottom. B, UT7-mpl cells were transiently transfected with the indicated promoter luciferase reporters along with control β-galactosidase expression vector. After transfection, cells were treated with medium (□), TPO (▨), or IFN-γ (▪) for 18 h, and luciferase and β-galactosidase activities were determined. Results are expressed as luciferase activity relative to β-galactosidase activity (upper panel). Alternatively, promoter activity was determined by dividing the relative luciferase activity of cells transfected with the mutated constructs by that of the cells transfected with the wild-type (wt) TAP1 promoter construct (lower panel). All plasmids were transfected a minimum of five times in separate experiments. The locations of the mutated nucleotides in the cis-acting elements are indicated within the schematic boxes. The cytokine-responsive region of the TAP1 promoter was previously reported to contain five cis-acting elements (Fig. 4⇑A) (11). Three regularly spaced and adjacent TTTC motifs were present in the overlapping ICSs and GAS, the last was included within the 5′ half of GAS. Each of these repeats may potentially bind IRFs, as deduced from crystallographic studies of IRF-DNA complexes (15, 16). We performed site-directed mutagenesis to generate constructs where IRF or STAT binding sequences were selectively disrupted without altering the functionality of the neighboring sites (see Fig. 4⇑). One mutant, thereafter designated mICS12, disrupted both the first and second TTTC motifs present in the overlapping ICS1-ICS2 sequence and could no longer bind IRF-binding proteins (data not shown); another one, thereafter designated mGAS, disrupted only the 3′ end, but not the 5′ end, of GAS that overlapped with the third IRF binding core motif and could no longer bind STAT (data not shown). Transfection of these mutant promoters into UT7-mpl cells showed that loss of either GAS or ICS individually impaired the ability of the promoter to respond to IFN-γ treatment (Fig. 4⇑B, ▪). Mutating either GAS or ICS also impaired the ability of the promoter to respond to TPO (▨). Each of these two mutations strongly inhibited the IFN-γ response, whereas they had only partial effects on the TPO response. These data indicate that GAS and ICS12 both participate in TPO- and IFN-γ-dependent TAP1 gene promoter activation, whereas an additional pathway(s) also contributes to TPO-dependent activation of this promoter. The ICS and GAS promoter elements are known to bind IRFs and STATs, respectively. TPO can activate STAT1, STAT3, and STAT5A/B depending on cell contexts (29), whereas STAT1 is the major STAT activated by IFN-γ in IFN-γ-responsive cells. In the UT7-mpl cells, TPO induced a sustained activation of STAT1 (Fig. 5⇓A) and STAT3 (data not shown), in addition to the previously reported activation of STAT5 (25, 30). 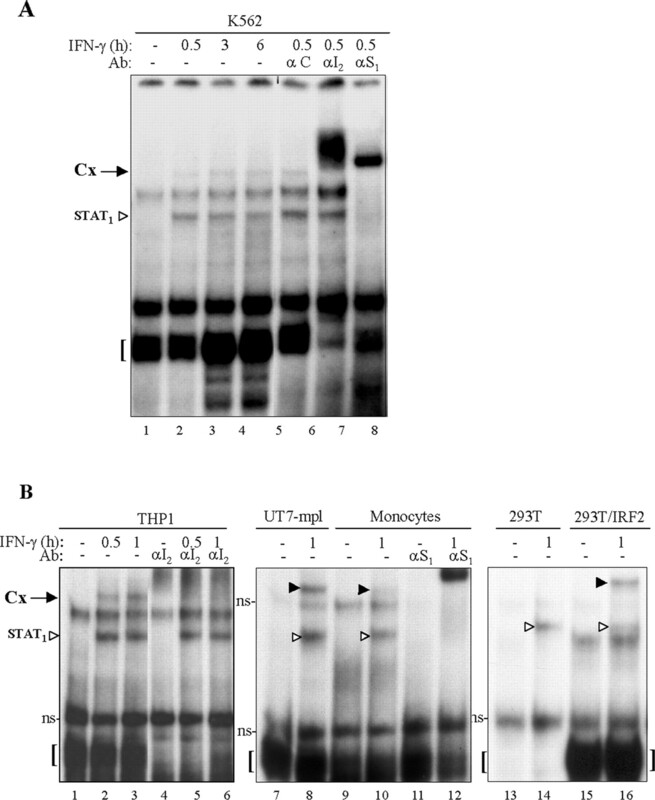 Western blot analysis using Abs directed against the active tyrosine-phosphorylated form of STAT1 also indicated that TPO and IFN-γ induced activation of STAT1 with similar kinetics (Fig. 5⇓A). We used EMSAs to determine which of the TPO-activated STAT factors actually bound to the TAP1-GAS regulatory sequence. After stimulation with TPO, STAT1 (Fig. 5⇓B, lanes 2 and 3), but not STAT3 or STAT5A/B (not shown), strongly bound to the TAP1-GAS motif. A similar strong binding of STAT1 was observed with nuclear extracts from UT7-mpl cells stimulated with IFN-γ (data not shown). TPO and IFN-γ activate STAT1 and induce the expression of IRF-1. A, Western blot analysis of nuclear cell extracts from cells treated for the indicated time with TPO or IFN-γ was performed using anti-tyrosine phosphorylated STAT1 (STAT1-PY), anti-IRF-1, or anti-IRF-2 Abs, as indicated on the left. B, EMSAs were performed with probes corresponding to GAS (lanes 1–3), ICS12 (lanes 4–9), ICS2-GAS (lanes 10–17), or ICS12-GAS (lanes 18–20) sequences from the TAP1 promoter (see schemes on the top of each panel) and nuclear extracts from UT7-mpl cells incubated with TPO for various periods of time. Supershift assays were performed using anti-STAT1 (α-S1; lanes 3, 9, and 17), anti-IRF-1 (α-I1; lanes 7 and 20), or anti-IRF-2 (α-I2; lane 8) Abs. Alternatively, EMSA was performed in the presence of a 100-fold excess of cold ICS2-GAS oligonucleotide (ON; lane 16). To better visualize protein-DNA complexes, free probe was run out of the gel. All EMSAs were performed under similar conditions, and gels were run for identical time. Square brackets point to monomeric IRF-containing complexes. Stars point to supershifted complexes. C, EMSA was similarly performed with extracts from cells treated for 0–1 h with TPO in the absence (lanes 1–3) or the presence of anti-IRF-2 Abs (lanes 4–6) using the ICS12 probe. Gel was subjected to a prolonged electrophoretic time and exposed to autoradiography. Only the area where the major monomeric IRF-containing complexes were visible (square bracket) is shown. ns, nonspecific band. We next analyzed the expression of IRFs by Western blotting. Untreated UT7-mpl cells weakly expressed IRF-1 and highly expressed IRF-2 (Fig. 5⇑A, lane 5). TPO and IFN-γ strongly enhanced the expression of IRF-1 (Fig. 5⇑A, middle panel), whereas the expression of IRF-2 remained unchanged (lower panel). EMSAs were performed to identify the IRFs that bind to the TAP1-ICSs. Because three adjacent TTTC/GAAA core elements lie in this sequence that may each bind IRFs (see Fig. 4⇑A), we used two different oligonucleotides as probes, one encompassing ICS1 and ICS2 sequences (designated ICS12) and another encompassing ICS2 and GAS (designated ICS2-GAS; see Table I⇑). The ICS12 probe was active in binding IRF factors; in the presence of untreated cell extracts, a large and diffuse band formed with the probe (Fig. 5⇑B, lane 4, see area square bracketed) that could be resolved in two discrete bands with a longer time of electrophoresis (Fig. 5⇑C, lane 1). Upon TPO or IFN-γ addition, the complexes increased (Fig. 5⇑B, lanes 4–6; Fig. 5⇑C, lanes 1–3; data not shown). Supershift analysis using Abs to each of the IRF factors indicated that IRF-1 and IRF-2 were both present in the large complex observed upon cytokine treatment (Fig. 5⇑B, lanes 7 and 8, see the decrease area bracketed and apparition of supershifted complexes). IRF-2 was the only factor initially bound to the ICS12 probe in cytokine-untreated cell extracts (data not shown). In accordance with its enhanced expression upon cytokine treatment, binding of IRF-1 to the probe increased with time, as revealed by supershift assays with anti-IRF-2 Abs (Fig. 5⇑C, lanes 4–6). We did not detect other IRF members bound to the probe (data not shown). We next used the ICS2-GAS as a probe and remarkably observed no binding of IRFs to this probe with either untreated or cytokine-treated (TPO or IFN-γ) cell extracts even after prolonged cytokine treatments (Fig. 5⇑B, lanes 10–15, see area bracketed; data not shown). Instead, only STAT1 bound to the probe in a rapid and sustained manner, as characterized by supershift assay (lane 17). These data indicate that ICS2-GAS is not a functional IRF-binding element despite the presence of two TTTC core elements, but is an active STAT1 binding site. Overall, this first analysis indicates that cytokine treatment induces the recruitment of STAT1 to GAS and IRF-1 to ICS12 sequences, whereas IRF-2 binds to ICS12 regardless of cytokine treatment. The complex structure of the cytokine-responsive region of TAP1 raised the possibility of a cooperative contribution of the ICSs with the overlapping GAS. We therefore performed EMSA with a probe encompassing the entire ICS1-ICS2-GAS region, hereafter referred to as ICS12-GAS. Similar to what we observed with ICS12 (Fig. 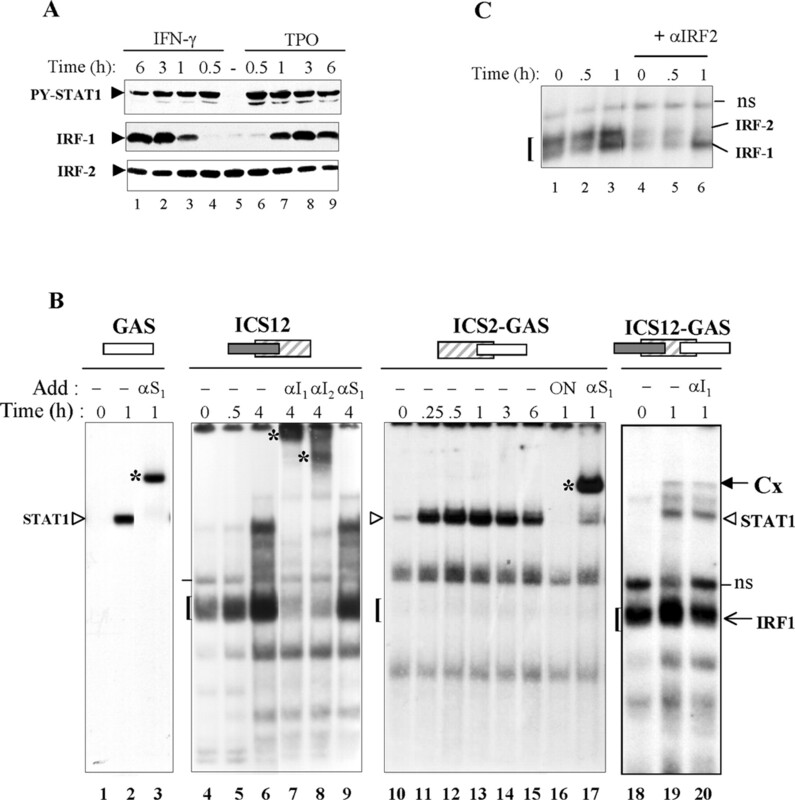 5⇑B, lanes 4–9), a large and diffuse complex bound to the ICS12-GAS probe in nuclear extracts from untreated cells (Fig. 5⇑B, lane 18, see square bracket) that rapidly increased upon TPO treatment (Fig. 5⇑B, lane 19). However, two new complexes also rapidly appeared after a few minutes of stimulation with TPO (Fig. 5⇑B, lane 19, and Fig. 6⇓), and were maintained over 3–24 h of stimulation with no change in their respective proportions (Fig. 6⇓B, lanes 2–6, and data not shown). These two complexes appeared with the same kinetics. They were similarly induced after IFN-γ treatment (data not shown). The lower complex (Fig. 5⇑B, white arrowhead) migrated exactly as the inducible STAT1 dimer that bound to the TAP1-GAS or ICS2-GAS probe (Fig. 5⇑B, compare lane 19 with lane 2 or 11). Supershift analysis using anti-STAT1 Abs confirmed the presence of STAT1 in that complex (Fig. 6⇓A, lane 5), but, surprisingly, anti-STAT1 Abs also supershifted the upper complex, thereafter designated Cx (black arrow Fig. 6⇓A, lane 5, and Fig. 8⇓, lanes 3 and 6), indicating the presence of STAT1 in that complex also. The only difference between the ICS2-GAS probe that bound a single STAT1 complex and ICS12-GAS was the presence of the extra ICS1. We therefore performed supershift assays with Abs directed against various IRFs to decipher the identities of Cx’s components. Although TPO and IFN-γ induced a strong expression of IRF-1, anti-IRF-1 Abs did not affect the migration of Cx (Fig. 6⇓A, lane 3), suggesting that IRF-1 did not participate with Cx. 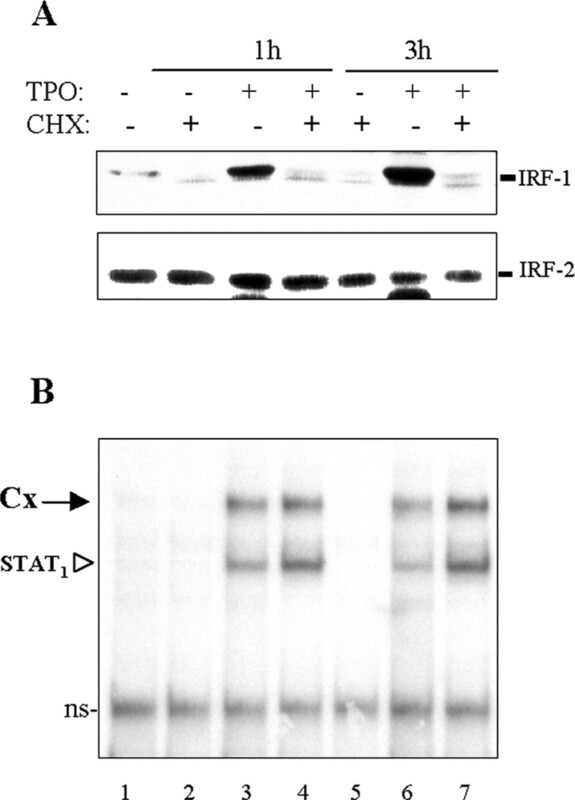 Abs directed against IRF-2, however, did shift Cx (Fig. 6⇓A, lane 4). Because cytokine treatment strongly increased IRF-1 expression and thus the IRF-1:IRF-2 ratio, we tested for the presence of IRF-2 in the Cx complex formed after different periods of cytokine treatment. As shown in Fig. 6⇓B, anti-IRF-2 Abs supershifted the normal monomeric IRF-2-probe complex (area square bracketed) that formed in untreated and cytokine treated extracts (see SS). In addition, anti-IRF-2 Abs displaced the Cx complex whatever the duration of cytokine treatment (Fig. 6⇓B, lanes 8–12), indicating that Cx included IRF-2 even when IRF-1 was highly expressed in the cytokine-treated cell. A new complex forms with the whole ICS1-ICS2-GAS region of the TAP1 promoter. A, Nuclear extracts (10 μg) from cells treated for 0–1 h with TPO were analyzed by EMSA using the ICS12-GAS probe in the absence (lanes 1 and 2) or the presence of anti-IRF-1 (αI1; lane 3), anti-IRF-2 (αI2; lane 4), or anti-STAT1 (αS1; lane 5) Abs. B, Nuclear extracts from cells treated for 0–2.5 h with TPO were analyzed by EMSA using the ICS12-GAS probe in the absence (lanes 1–6) or the presence of anti-IRF-2 Abs (lanes 7–12). SS, supershifted complexes. C, Nuclear extracts were prepared from cells incubated without (lane 1) or with (lanes 2–9) TPO for 1 h and were analyzed by EMSA using the ICS12-GAS probe in the presence of a 5-, 10-, or 25-fold molar excess of cold ICS12 (lanes 3–5) or GAS (lanes 7–9) in the reaction medium. Square brackets point to monomeric IRF-1 and IRF-2 complexes. ns, nonspecific band. White arrowheads point to STAT1 dimers; black arrows point to complex Cx. If a probe contains two binding sites for two unrelated transcription factors that bind to the probe independently, as should be the case for STAT1 and IRFs with ICS12-GAS, the probability that these two factors bind simultaneously to the same probe molecule is expected to be very weak, especially if EMSAs are performed in the presence of large excess of probe, which is the case in our experimental conditions. The consequence is that complexes, including a single transcription factor bound to the probe, should be in much larger amounts than complexes including two bound factors. The Cx complex we observed with ICS12-GAS was present in equal amounts as the GAS-bound STAT1 (Fig. 6⇑), ruling out the possibility that it reflected the independent, but simultaneous, cobinding of STAT1 and IRF to the probe. This observation suggests that the presence of IRF-2 bound to the ICS1 sequence favors the binding of STAT1 to the ICS12-GAS probe, leading to the formation of a new STAT1-containing complex. This complex includes STAT1 and IRF-2, but no detectable IRF-1, even upon prolonged cytokine treatment when cells express large amounts of IRF-1 (Fig. 6⇑B, lanes 10–12, see the IRF-1 complex at the bottom). These data provide evidence for the existence of selective synergistic interactions between STAT1 and IRF-2 for binding to the cytokine-responsive region of TAP1, whereas IRF-1 binds to the ICS12-GAS probe separately. To further characterize the synergistic interactions between STAT1 and IRF-2 observed with the ICS12-GAS probe, we performed competition assays with cold oligonucleotides in EMSA. As shown in Fig. 6⇑C, Cx could be competed with GAS or ICS12 oligonucleotides (lanes 3–5 and 7–9). ICS12 competed for Cx at the same concentrations as it competed for IRF-1- and IRF-2-only complexes (see bracketed complexes at the bottom of Fig. 6⇑C, lanes 3–5), but it did not affect the binding of STAT1 dimers (open arrowhead). Binding of the two STAT1 complexes was competed with GAS (lanes 7–9). These results indicate that ICS and GAS sequences are both required for the formation of the STAT1/IRF-2/DNA complex Cx. IRF-1 was originally identified as an activating protein that binds to the IFN-stimulated response element of IFN-αβ-stimulated genes. It was reported to be associated with antiviral activity and to be up-regulated by IFN-γ in multiple cellular contexts (14). We have similarly observed that TPO and IFN-γ strongly enhanced the expression of IRF-1 in megakaryocytes (Fig. 5⇑A). IRF-1−/− mice also showed that IRF-1 was required for basal expression of TAP1 (17). We therefore wondered whether IRF-1 per se participated in TPO- or IFN-γ-dependent expression of TAP1. Because the induction of TAP1 mRNA by TPO or IFN-γ was independent of protein translation (Fig. 3⇑), we analyzed the expression of IRF-1 after cytokine treatment in the presence of an inhibitor of protein synthesis. As shown in Fig. 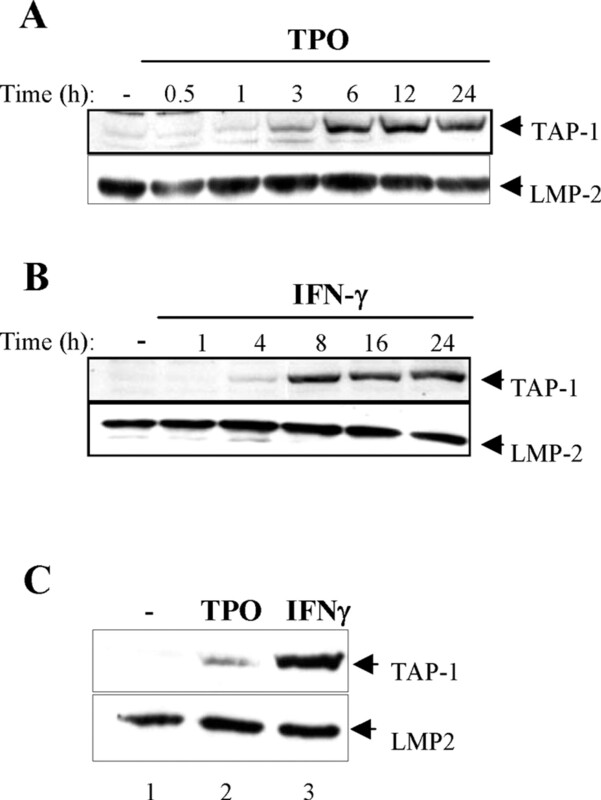 7⇓A, short treatment of the cells with cycloheximide totally abolished the induction of IRF-1 by TPO or IFN-γ (upper panel), whereas it did not affect the expression of IRF-2 (lower panel). We similarly tested whether formation of Cx relied on active protein synthesis. As shown in Fig. 7⇓B, both STAT1/IRF-2/DNA complex Cx and the DNA-bound STAT1 dimer formed equally well with extracts from cells treated with TPO (lanes 3 and 4 and lanes 6 and 7) or IFN-γ (data not shown) in the presence or the absence of cycloheximide. These characteristics rule out the participation of IRF-1 in TPO- or IFN-γ-induced TAP1 expression or in the formation of Cx. Because both STAT- and IRF-binding sites are required for full activation of the TAP1 promoter after IFN-γ or TPO treatment (Fig. 3⇑), because only STAT1, IRF-1 and IRF-2 bind to the cytokine-responsive element of TAP1, these data indicate that both STAT1 and IRF-2 participate in the cytokine-dependent activation of TAP1 gene transcription. Cytokine-activated STAT1 and STAT1/IRF-2/DNA complexes can form in the absence of active protein synthesis, whereas IRF-1 cannot. UT7-mpl cells were pretreated in the absence (−) or the presence (+) of cycloheximide (CHX), then treated without (−) or with (+) TPO for the indicated time. Nuclear extracts were prepared and analyzed by Western blotting (A) using anti-IRF-1 (upper panel) or anti-IRF-2 (middle panel) Abs or by EMSA (B) using the ICS12-GAS probe. In addition, our data demonstrate that TPO and IFN-γ induce the rapid formation of two slowly migrating complexes that bind to the cytokine-responsive region of the TAP1 promoter, and whose kinetics and characteristics of formation perfectly fit with the characteristics of induction of TAP1 mRNA; both TAP1 mRNAs and Cx or STAT1 dimers are induced rapidly (<3 h) and independently of active protein synthesis. Taken together, these data suggest a crucial role for STAT1/IRF-2 promoter-bound complex Cx in cytokine-dependent TAP1 gene activation. Among the IRF members, to date only p48/IRF-9 and IRF-1 are known to interact with STAT1. IRF-9 was originally described as the partner of activated STAT1 and STAT2 in the trimeric IFN-α-stimulated gene factor-3 (31), whereas IRF-1 was reported to associate with unphosphorylated STAT1 (32). These two factors associate with STAT1 through a different, nonconserved region, located in either the C-terminal region (IRF-9) or the central part (IRF-1) of the molecule, outside the IRF DBD. We wanted to delineate the region of IRF-2 required for the formation of Cx. Plasmids encoding for truncated versions of the molecule were introduced into UT7-mpl cells, and the formation of a STAT1/IRF-2/DNA complex was evaluated by EMSAs and supershift assays after cytokine treatment. As shown in Fig. 8⇓, the truncated IRF-21–224 and the IRF-21–155 mutant, which only included the DBD, were both able to form a cytokine-dependent complex with STAT1 and ICS12-GAS (black arrowheads). These data indicate that the IRF-2 DBD is sufficient to mediate cooperative interactions with STAT1 and the TAP1 promoter-responsive region. The DBD of IRF-2 is sufficient to form a complex with STAT1 on the TAP1 cytokine-responsive element. UT7-mpl cells were transfected with expression vectors encoding either full-length or truncated forms of IRF-2, as indicated. Cells were maintained in culture for 24 h and either left untreated (−) or treated with TPO (+) for 1 h before preparing nuclear extracts. Extracts were incubated without (−) or with anti-STAT1 Abs (S1) and the ICS12-GAS probe and were analyzed by EMSA. Black arrowheads point to STAT1/IRF-2/DNA complexes Cx; white arrowheads point to the canonical STAT1 dimer complexes. The existence of a STAT1/IRF-2 complex has never been reported, and the binding of IRF-2 to the TAP1 promoter in particular has not been observed. We therefore studied the factors bound to the ICS12-GAS-responsive element in multiple IFN-γ-responsive cells. IFN-γ triggered the simultaneous formation of two STAT1-containing complexes in a variety of IFN-γ-responsive cells, including the erythroleukemic K562 cell line (Fig. 9⇓A) and the monocytic THP-1 cell line (Fig. 9⇓B, lanes 1–6), and also in normal monocytes isolated from human blood samples (lanes 9–12). These complexes exhibited the same electrophoretic mobility as the STAT1 dimer and the new STAT1/IRF-2/DNA complex Cx characterized in the activated UT7-mpl cells (lanes 7 and 8). Supershift analysis confirmed that the upper complex actually contained both STAT1 (Fig. 9⇓A, lane 8; Fig. 9⇓B, lane 12) and IRF-2 (Fig. 9⇓A, lane 7; Fig. 9⇓B, lanes 4–6). These data indicate that two cytokines, TPO and IFN-γ, induce the formation of a previously undepicted STAT1/IRF-2/TAP1 DNA complex in their major target cells. DNA-bound IRF-2 and IFN-γ-activated STAT1 form a complex with the TAP1 cytokine-responsive element in a variety of cellular contexts. K562 (A) or THP-1 (B, lanes 1–6), UT7-mpl cells (B, lanes 7 and 8), and peripheral monocytes (B, lanes 9–12) were incubated with IFN-γ as indicated on the top of each panel. Nuclear extracts were prepared and analyzed by EMSA in the absence or the presence of the indicated Abs, using the ICS12-GAS probe. Alternatively, 293T cells were transfected with empty vector (B, lanes 13 and 14) or IRF-2 expression vector (lanes 15 and 16) and maintained in culture for 24 h. Where indicated (1), IFN-γ was added for 1 h before the end of the culture. Nuclear extracts were prepared and analyzed by EMSA using the ICS12-GAS probe. Black arrowheads show the STAT1/IRF-2/DNA complexes (Cx) formed with each type of extracts; empty arrowheads show the canonical STAT1 dimer. Monomeric IRF-1 or IRF-2 complexes are indicated by square brackets. In the course of these studies we observed that human embryonic kidney 293T cells expressed undetectable levels of active IRF-1 or IRF-2 by EMSA (see area bracketed, Fig. 9⇑B, lanes 13 and 14). IFN-γ only triggered the binding of STAT1 dimers to the ICS12-GAS probe, but the STAT1/IRF-2 complex Cx was not detected (lane 14). We introduced an expression vector for IRF-2 and treated the 293T cells with IFN-γ. In these transfected cells, IFN-γ triggered the formation of two DNA-bound complexes similar to those observed in UT7-mpl cells (lanes 15 and 16), which both included STAT1 (data not shown). This indicates that the sole presence of IRF-2 allows the formation of a STAT1/IRF-2-containing complex with the TAP1 cytokine-responsive element. We also introduced the vectors encoding the same truncated forms of IRF-2 as described above (Fig. 8⇑) and stimulated the cells with IFN-γ. We similarly observed that the IRF-2 DBD is sufficient for mediating cooperative interactions with IFN-γ-activated STAT1 and the TAP1 promoter-responsive region in this cellular context (data not shown). Overall, these data indicate that the sole DBD of IRF-2 can cooperate with STAT1 for binding to the cytokine-responsive region of TAP1 after stimulation with two different cytokines (TPO and IFN-γ) in two different cellular contexts (hemopoietic and epithelial). IRF-2 has never been reported to regulate TAP1 expression. Moreover, IRF-2 was originally described as a transcriptional repressor that antagonized IRF-1 activity by competing for binding to the ICS of IFNs and IFN-inducible genes (14). However, recent evidence indicates that IRF-2 can act as a dual function transcription factor, because it also activates the transcription of some genes (33, 34). Therefore, to ascertain the role of IRF-2 in the regulation of TAP1 promoter activity, we evaluated the biological contribution of IRF-2 to the activity of the TAP1 promoter in two cellular contexts. We performed transient transfection assays with the TAP1 promoter reporter construct in the presence of an IRF-2 expression vector, both introduced either in 293T cells, which express undetectable amounts of IRF-1/2-binding activity (see above, Fig. 9⇑B), or in MEF from IRF-1−/− IRF-2−/− double-knockout mice devoid of IRF-1 and IRF-2 proteins. As shown in Fig. 10⇓, IRF-2 increased the activity of the TAP1 gene promoter in a dose-dependent manner in both 293T cells and IRF-1−/−IRF-2−/− MEF. These data indicate that IRF-2 positively regulates TAP1 promoter activity. IRF-2 activates the TAP1 promoter. 293T cells (left panel) or IRF-1−/−IRF-2−/− MEF (right panel) were transiently transfected with the wild-type TAP1 promoter luciferase reporter (200 ng) along with the indicated quantity of a vector encoding wild-type IRF-2. Cells were maintained for 18 h in culture before measuring luciferase activity. All plasmids were transfected a minimum of five times in separate experiments. The figure shows one representative experiment with each cell type. Our results first show that TPO activates the expression of functional TAP1 in TPO-responsive hemopoietic cells, with the consequence of enhanced expression of class I MHC on the cell surface. This expression of TAP1 and class I MHC molecules was of the same magnitude as that triggered by IFN-γ in the same cells. These observations raise the possibility that TPO-responsive cells such as megakaryocytes directly participate in the immune response. Although the main functional role attributed to platelets was hemostasis and maintenance of the integrity of blood vessel wall, it has become apparent that platelets also play a prominent role in modulating inflammation. Upon activation, platelets release chemokines and cytokines and, upon binding to endothelial cells, induce the production of a broad array of inflammatory molecules (35, 36, 37, 38). Their capacity to function during host defense against infection has recently received attention (37). Platelets express HLA molecules. Taking into account platelet number, it was estimated that approximately two-thirds of the HLA molecules from blood were carried by platelets. The majority of these HLA molecules were reported to be of endogenous origin, and it was generally assumed that this synthesis occurred at the megakaryocyte stage (39). Moreover, activated platelets can bind and phagocytose various infectious microorganisms, and engulfing vacuoles were reported to fuse with α-granules that contain microbicidal proteins (40, 41, 42). These interactions can induce degradation of pathogens. Moreover, viral Ags subsequently appeared on the surface of the cells (38). Platelet concentrates were also shown to have a virucidal effect, and they released potent antimicrobial peptides that killed pathogens (37, 41). All these properties are expected for megakaryocytes, which can be activated and are known to contain multivesicular bodies and secretory granules and to degranulate exactly as platelets do, and are known to be a direct target of HIV infection (40, 43, 44). These processes may favor the expression of antigenic peptides. In addition, platelets were recently shown to actively participate in innate and adaptive immunity via their CD154/CD40L that induced dendritic cell maturation, B cell isotype switching, and enhanced CD8+ T cell response both in vitro and in vivo (45). Moreover, depletion of platelets in normal mice results in decreased Ag-specific Ab production (45). High expression of TAP1 and class I MHC in megakaryocytes or platelets may thus reflect an additional role of this cell lineage in host defense. Our study searched for the mechanism(s) responsible for the enhanced expression of TAP1 observed upon IFN-γ or TPO treatment of megakaryocytic cells. It provides evidence that these two cytokines activate the expression of TAP1 through a novel mechanism which involves STAT1 and the un-expected participation of IRF-2. Numerous complementary observations support this conclusion. First, TPO and IFN-γ activate the expression of TAP1 at the transcriptional level and the enhanced TAP1 promoter activity induced by the two cytokines depends on the presence of both a functional GAS and an active IRF-binding site (ICS12). Second, this ICS12 only binds IRF-1 and IRF-2, but no other members of the IRF family in vitro, therefore suggesting that IRF-1, IRF-2, or both regulate TAP1 promoter activity after cytokine treatment. Third, the accumulation of TAP1 mRNA induced by IFN-γ/TPO does not require the presence of an active translation machinery, whereas IFN-γ- and TPO-dependent expression of IRF-1 requires active protein synthesis, thereby ruling out the participation of IRF-1 in the cytokine-dependent activation of TAP1. Fourth, TPO and IFN-γ rapidly activate STAT1. In accordance with the kinetics of TAP1 mRNA induction, cytokine-activated STAT1 forms two types of complexes with the cytokine-responsive element of the TAP1 promoter in vitro: 1) a STAT1 dimer, which is the sole complex bound to the isolated TAP1-GAS element; and 2) a novel STAT1/IRF-2/DNA complex that is recognized by both anti-STAT1 and anti-IRF-2 Abs and whose formation follows the same kinetics as STAT1 dimers, thus indicating cooperative binding of IRF-2 and STAT1 to the cytokine-responsive region. Fifth, IRF-2 per se can transactivate the TAP1 gene. Finally, we show that DNA-bound IRF-2 cooperates for the binding of TPO/IFN-γ-activated STAT1 to the TAP1-responsive element in vitro in all the TPO/IFN-γ-responsive cell types we have tested, including circulating monocytes, the major normal IFN-γ target cells, suggesting that IRF-2 activates the TAP1 gene promoter after TPO or IFN-γ in all their responsive cells. Previous studies of IRF-1-deficient mice have emphasized the crucial role of IRF-1 for the basal expression of TAP1 (17). However, IFN-γ-dependent expression of TAP1 was unaffected in these IRF-1−/− animals. Our data extend these preliminary observations and rule out the participation of IRF-1 in IFN-γ-dependent expression of TAP1, because that expression is independent of protein synthesis. They, moreover, show that IRF-2 participates in TAP1 gene expression as a basal transactivator, and also contributes selectively to the extra cytokine-dependent activation of the TAP1 gene because both GAS and ICS are required to activate TAP1 promoter. Furthermore, IRF-2 also cooperates for the recruitment of active STAT1 to the promoter. Although the specific binding of STAT1 to TAP1-GAS and that of IRF-1 to ICS have been observed in multiple cellular contexts, the nuclear factors bound to the entire ICS12-GAS region have never been analyzed. Because of the presence of overlapping ICS and GAS elements within the TAP1 promoter, steric clashes, synergies, or changes in selectivity for DNA binding between transcription factors were expected. We demonstrate that the ICS12 sequence when linked to GAS allows the formation of a new complex composed of STAT1 and IRF-2, with no detectable IRF-1. This result was not expected, because TPO and IFN-γ trigger the rapid synthesis of large amounts of IRF-1, which binds to ICS12 or ICS12-GAS elements individually, as detected in EMSA. It thus indicates that IRF-2 contains a specific element that allows selective cooperative binding of STAT1 and IRF-2 on the TAP1 promoter. The reason for this cooperation is presently unknown, but we propose three hypotheses. First, IRF-2 may directly interact with STAT1. STAT1 has already been reported to interact with IRF-1, but this interaction involves the rather specific central region of IRF-1, outside the DBD. Remarkably, this interaction involves unphosphorylated STAT1, and IFN-γ does not affect this basal interaction, suggesting that IRF-1 cannot form a more stable complex with a cytokine-activated STAT1 (32). IRF-9 was also originally described as the partner of activated STAT1 and STAT2 in the trimeric IFN-α-stimulated gene factor-3 complex (31), but this factor associates with STAT1 through a different, nonconserved region, located in the C-terminal region of the molecule. We now show that the sole DBD of IRF-2 is sufficient to allow cooperative binding of STAT1 to the TAP1 promoter. This domain is highly conserved among IRF members and exhibits a high homology (84%) with IRF-1, making the presence of a selective and restricted association of IRF-2 DBD with activated STAT1 quite unexpected. All our attempts to detect possible association of STAT1 with IRF-2 in solution failed, suggesting that free IRF-2 may be unable to interact with activated STAT1. These data led us to favor a second hypothesis. IRF-2 is known to induce particularly strong DNA bending, which is responsible for efficient interactions of DNA-bound IRF-2 with a second IRF-2 molecule (16) or with IRF-8/ICSBP (46). Such bending of DNA sequences was observed with the sole DBD of IRF-2, whereas the highly homologous DBD of IRF-1 was without effect (15, 16). We thus propose that binding of IRF-2 to the TAP1 gene induces a selective DNA conformation that enhances the recruitment of STAT1 to neighboring DNA sequences. Third, and not mutually exclusive with the second hypothesis, the binding of IRF-2 to DNA may modify IRF-2 conformation in such a way that it exposes a STAT1 interaction domain, or even an interaction domain for a partner (transcription regulator, coactivators, etc.) shared with the activated STAT1 that would thus, indirectly, favor the association of STAT1 to DNA-bound IRF-2. IRF-2 was originally described as an antagonist of IRF-1-mediated regulation of IFN-inducible genes by competition for binding at the same DNA locus. IRF-1 was shown to induce the expression of IFN-αβ and to have antioncogenic activity, whereas IRF-2 repressed these actions (14). In addition to its repressive effects on IFN-related genes, IRF-2 can activate the transcription of a set of genes, such as histone H4 and VCAM-1 genes (33, 47, 48), whereas IRF-1 cannot. IRF-2 also synergizes with IRF-1 in activating two well-known IFN-γ target genes, CIITA and guanylate-binding protein (34, 49). Surprisingly, IRF-1- and IRF-2-deficient mice were shown to have remarkably similar phenotypes in terms of their defect in Th1 differentiation, NK cell development, and cytokine secretion profiles, suggesting that IRF-2, like IRF-1, mediates part of its effect through direct transcriptional activation and confirming a specific role for IRF-2 in the immune system (50, 51). Moreover, recent studies have highlighted a role for IRFs in hemopoietic differentiation and shown that IRF-1 favors granulocytic differentiation, whereas IRF-2 drives megakaryocytic differentiation (52). Our results demonstrate that IRF-2 can transactivate a gene whose product directly participates in immune recognition. IRF-2 has long been described to possess both a transcriptional repression domain and a latent activation domain (53), consistent with the negative and positive regulation of gene expression by this factor. IRF-2 was recently shown to interact with histone acetylases, such as p300 and pCAF, originally known as global coactivators and members of the transcription machinery and to be highly acetylated compared with IRF-1 (54, 55). Moreover, a new bromo domain protein that exhibits similarities with transcriptional coactivators was identified that interacts with IRF-2 (56). Some of these partners also interact with STAT1 (p300/CBP) and may provide the active link responsible for DNA-binding cooperation between STAT1 and prebound IRF-2. All these partners may participate in the IRF-2-dependent activation of the TAP1 promoter. Overall, our data provide the first evidence that the cytokine TPO, as the inflammatory cytokine IFN-γ, can enhance the expression of TAP1 in megakaryocytes. It, moreover, demonstrates that both IRF-2 and STAT1 play active roles in TPO- and IFN-γ-mediated TAP1 promoter activation. We propose that constitutive binding of IRF-2 to the TAP1 promoter enhances the selective recruitment of activated STAT1 and favors subsequent functional and positive associations with the basal transcription machinery. We thank Dr. D. Johnson (New Haven, CT) for providing the wild-type TAP1 promoter construct, and Dr. P. M. van Endert (Paris, France) and Dr. R. Tampe (Frankfurt/Main, Germany) for providing anti-TAP1 Abs; and Drs. L. Bénit, V. Mignotte, and P.-H. Roméo for helpful comments on the manuscript. ↵1 This work was supported in part by l’Association de Recherche contre le Cancer (to I.D.-F). ↵3 Abbreviations used in this paper: MHCI, class I MHC complex; TAP, transport of antigenic peptide; DBD, DNA-binding domain; EPO, erythropoietin; GAS, IFN-γ-activated sequence; ICS, IFN consensus sequence; IRF, IFN regulatory factor; LMP, low molecular weight polypeptide; MEF, murine embryonic fibroblast; TPO, thrombopoietin. Yewdell, J. W., J. R. Bennink. 1992. Cell biology of antigen processing and presentation to major histocompatibility complex class I molecule-restricted T lymphocytes. Adv. Immunol. 52:1. Groettrup, M., A. Soza, U. Kuckelkorn, P. M. Kloetzel. 1996. Peptide antigen production by the proteasome: complexity provides efficiency. Immunol. Today 17:429. Neefjes, J. J., F. Momburg, G. J. Hammerling. 1993. Selective and ATP-dependent translocation of peptides by the MHC-encoded transporter. Science 261:769. Owen, B. A., L. R. Pease. 1999. TAP association influences the conformation of nascent MHC class I molecules. J. Immunol. 162:4677. Johnson, D. R., B. Mook-Kanamori. 2000. Dependence of elevated human leukocyte antigen class I molecule expression on increased heavy chain, light chain (β2-microglobulin), transporter associated with antigen processing, tapasin, and peptide. J. Biol. Chem. 275:16643. Spies, T., R. DeMars. 1991. Restored expression of major histocompatibility class I molecules by gene transfer of a putative peptide transporter. Nature 351:323.
de la Salle, H., D. Hanau, D. Fricker, A. Urlacher, A. Kelly, J. Salamero, S. H. Powis, L. Donato, H. Bausinger, M. Laforet, et al 1994. 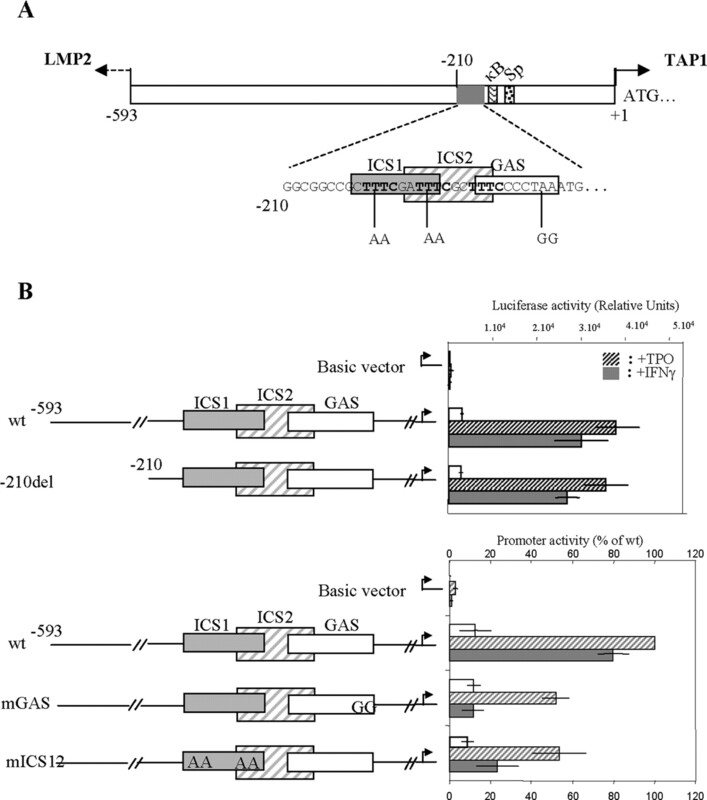 Homozygous human TAP peptide transporter mutation in HLA class I deficiency. Science 265:237. Blanchet, O., J. F. Bourge, H. Zinszner, A. Israel, P. Kourilsky, J. Dausset, L. Degos, P. Paul. 1992. Altered binding of regulatory factors to HLA class I enhancer sequence in human tumor cell lines lacking class I antigen expression. Proc. Natl. Acad. Sci. USA 89:3488. Rotem-Yehudar, R., M. Groettrup, A. Soza, P. M. Kloetzel, R. Ehrlich. 1996. 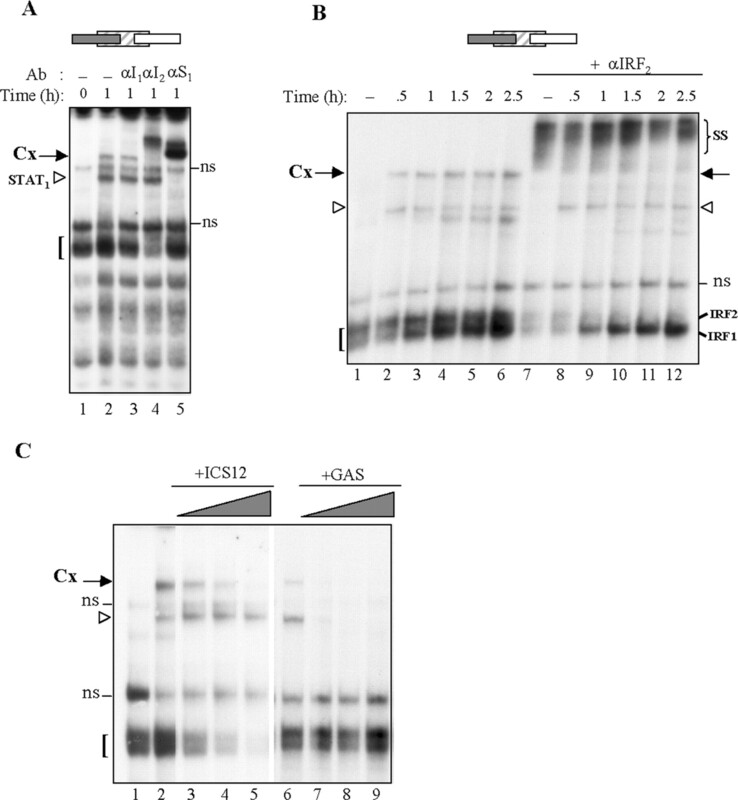 LMP-associated proteolytic activities and TAP-dependent peptide transport for class 1 MHC molecules are suppressed in cell lines transformed by the highly oncogenic adenovirus 12. J. Exp. Med. 183:499. Wright, K. L., L. C. White, A. Kelly, S. Beck, J. Trowsdale, J. P. Ting. 1995. Coordinate regulation of the human TAP1 and LMP2 genes from a shared bidirectional promoter. J. Exp. Med. 181:1459. Min, W., J. S. Pober, D. R. Johnson. 1996. Kinetically coordinated induction of TAP1 and HLA class I by IFN-γ: the rapid induction of TAP1 by IFN-γ is mediated by Stat1α. J. Immunol. 156:3174. Cramer, L. A., S. L. Nelson, M. J. Klemsz. 2000. Synergistic induction of the Tap-1 gene by IFN-γ and lipopolysaccharide in macrophages is regulated by STAT1. J. Immunol. 165:3190. Chatterjee-Kishore, M., R. Kishore, D. J. Hicklin, F. M. Marincola, S. Ferrone. 1998. Different requirements for signal transducer and activator of transcription 1α and interferon regulatory factor 1 in the regulation of low molecular mass polypeptide 2 and transporter associated with antigen processing 1 gene expression. J. Biol. Chem. 273:16177. Escalante, C. R., J. Yie, D. Thanos, A. K. Aggarwal. 1998. Structure of IRF-1 with bound DNA reveals determinants of interferon regulation. Nature 391:103. Fujii, Y., T. Shimizu, M. Kusumoto, Y. Kyogoku, T. Taniguchi, T. Hakoshima. 1999. Crystal structure of an IRF-DNA complex reveals novel DNA recognition and cooperative binding to a tandem repeat of core sequences. EMBO J. 18:5028. White, L. C., K. L. Wright, N. J. Felix, H. Ruffner, L. F. Reis, R. Pine, J. P. Ting. 1996. Regulation of LMP2 and TAP1 genes by IRF-1 explains the paucity of CD8+ T cells in IRF-1−/− mice. Immunity 5:365. Kaushansky, K.. 1999. The enigmatic megakaryocyte gradually reveals its secrets. BioEssays 21:353. Kaushansky, K.. 1999. Thrombopoietin and hematopoietic stem cell development. Ann. NY Acad. Sci. 872:314. Souyri, M., I. Vigon, J. F. Penciolelli, J. M. Heard, P. Tambourin, F. Wendling. 1990. A putative truncated cytokine receptor gene transduced by the myeloproliferative leukemia virus immortalizes hematopoietic progenitors. Cell 63:1137. Matsumura, I., K. Nakajima, H. Wakao, S. Hattori, K. Hashimoto, H. Sugahara, T. Kato, H. Miyazaki, T. Hirano, Y. Kanakura. 1998. Involvement of prolonged ras activation in thrombopoietin-induced megakaryocytic differentiation of a human factor-dependent hematopoietic cell line. Mol. Cell. Biol. 18:4282. Porteu, F., M. C. Rouyez, L. Cocault, L. Benit, M. Charon, F. Picard, S. Gisselbrecht, M. Souyri, I. Dusanter-Fourt. 1996. Functional regions of the mouse thrombopoietin receptor cytoplasmic domain: evidence for a critical region which is involved in differentiation and can be complemented by erythropoietin. Mol. Cell. Biol. 16:2473. Cwirla, S. E., P. Balasubramanian, D. J. Duffin, C. R. Wagstrom, C. M. Gates, S. C. Singer, A. M. Davis, R. L. Tansik, L. C. Mattheakis, C. M. Boytos, et al 1997. Peptide agonist of the thrombopoietin receptor as potent as the natural cytokine. Science 276:1696.
van Endert, P. M., R. Tampe, T. H. Meyer, R. Tisch, J. F. Bach, H. O. McDevitt. 1994. A sequential model for peptide binding and transport by the transporters associated with antigen processing. Immunity 1:491. Magne, S., S. Caron, M. Charon, M. C. Rouyez, I. Dusanter-Fourt. 2003. STAT5 and Oct-1 form a stable complex that modulates cyclin D1 expression. Mol. Cell. Biol. 23:8934. Caron, S., M. Charon, E. Cramer, N. Sonenberg, I. Dusanter-Fourt. 2004. Selective modification of eukaryotic initiation factor 4F (eIF4F) at the onset of cell differentiation: recruitment of eIF4GII and long-lasting phosphorylation of eIF4E. Mol. Cell. Biol. 24:4920. Fichelson, S., J. M. Freyssinier, F. Picard, M. Fontenay-Roupie, M. Guesnu, M. Cherai, S. Gisselbrecht, F. Porteu. 1999. Megakaryocyte growth and development factor-induced proliferation and differentiation are regulated by the mitogen-activated protein kinase pathway in primitive cord blood hematopoietic progenitors. Blood 94:1601. Ma, W., P. J. Lehner, P. Cresswell, J. S. Pober, D. R. Johnson. 1997. Interferon-γ rapidly increases peptide transporter (TAP) subunit expression and peptide transport capacity in endothelial cells. J. Biol. Chem. 272:16585. Kaushansky, K.. 1999. Thrombopoietin: from theory to reality. Thromb. Haemost. 82:312. Pallard, C., F. Gouilleux, L. Benit, L. Cocault, M. Souyri, D. Levy, B. Groner, S. Gisselbrecht, I. Dusanter-Fourt. 1995. Thrombopoietin activates a STAT5-like factor in hematopoietic cells. EMBO J. 14:2847. Horvath, C. M., G. R. Stark, I. M. Kerr, J. E. Darnell, Jr. 1996. Interactions between STAT and non-STAT proteins in the interferon-stimulated gene factor 3 transcription complex. Mol. Cell. Biol. 16:6957. Chatterjee-Kishore, M., K. L. Wright, J. P. Ting, G. R. Stark. 2000. How Stat1 mediates constitutive gene expression: a complex of unphosphorylated Stat1 and IRF1 supports transcription of the LMP2 gene. EMBO J. 19:4111. Vaughan, P. S., F. Aziz, A. J. van Wijnen, S. Wu, H. Harada, T. Taniguchi, K. J. Soprano, J. L. Stein, G. S. Stein. 1995. Activation of a cell-cycle-regulated histone gene by the oncogenic transcription factor IRF-2. Nature 377:362. Xi, H., D. D. Eason, D. Ghosh, S. Dovhey, K. L. Wright, G. Blanck. 1999. Co-occupancy of the interferon regulatory element of the class II transactivator (CIITA) type IV promoter by interferon regulatory factors 1 and 2. Oncogene 18:5889. Majka, M., T. Rozmyslowicz, B. Lee, S. L. Murphy, Z. Pietrzkowski, G. N. Gaulton, L. Silberstein, M. Z. Ratajczak. 1999. Bone marrow CD34+ cells and megakaryoblasts secrete β-chemokines that block infection of hematopoietic cells by M-tropic R5 HIV. J. Clin. Invest. 104:1739. Lindemann, S., N. D. Tolley, D. A. Dixon, T. M. McIntyre, S. M. Prescott, G. A. Zimmerman, A. S. Weyrich. 2001. Activated platelets mediate inflammatory signaling by regulated interleukin 1β synthesis. J. Cell Biol. 154:485. Klinger, M. H., W. Jelkmann. 2002. Role of blood platelets in infection and inflammation. J. Interferon Cytokine Res. 22:913. Yeaman, M. R.. 1997. The role of platelets in antimicrobial host defense. Clin. Infect. Dis. 25:951. Gouttefangeas, C., M. Diehl, W. Keilholz, R. F. Hornlein, S. Stevanovic, H. G. Rammensee. 2000. Thrombocyte HLA molecules retain nonrenewable endogenous peptides of megakaryocyte lineage and do not stimulate direct allocytotoxicity in vitro. Blood 95:3168. Youssefian, T., A. Drouin, J. M. Masse, J. Guichard, E. M. Cramer. 2002. Host defense role of platelets: engulfment of HIV and Staphylococcus aureus occurs in a specific subcellular compartment and is enhanced by platelet activation. Blood 99:4021. Maurice, A., M. Marchand-Arvier, D. Edert, A. Le Faou, G. Gondrexon, C. Vigneron. 2002. The virucidal effect of platelet concentrates: preliminary study and first conclusions. Platelets 13:219. Krijgsveld, J., S. A. Zaat, J. Meeldijk, P. A. van Veelen, G. Fang, B. Poolman, E. Brandt, J. E. Ehlert, A. J. Kuijpers, G. H. Engbers, et al 2000. Thrombocidins, microbicidal proteins from human blood platelets, are C-terminal deletion products of CXC chemokines. J. Biol. Chem. 275:20374. Louache, F., A. Bettaieb, A. Henri, E. Oksenhendler, J. P. Farcet, P. Bierling, M. Seligmann, W. Vainchenker. 1991. Infection of megakaryocytes by human immunodeficiency virus in seropositive patients with immune thrombocytopenic purpura. Blood 78:1697. Cramer, E. M., J. M. Masse, J. P. Caen, I. Garcia, J. Breton-Gorius, N. Debili, W. Vainchenker. 1993. Effect of thrombin on maturing human megakaryocytes. Am. J. Pathol. 143:1498. Elzey, B. D., J. Tian, R. J. Jensen, A. K. Swanson, J. R. Lees, S. R. Lentz, C. S. Stein, B. Nieswandt, Y. Wang, B. L. Davidson, et al 2003. Platelet-mediated modulation of adaptive immunity: a communication link between innate and adaptive immune compartments. Immunity 19:9. Meraro, D., S. Hashmueli, B. Koren, A. Azriel, A. Oumard, S. Kirchhoff, H. Hauser, S. Nagulapalli, M. L. Atchison, B. Z. Levi. 1999. Protein-protein and DNA-protein interactions affect the activity of lymphoid-specific IFN regulatory factors. J. Immunol. 163:6468. Vaughan, P. S., C. M. van der Meijden, F. Aziz, H. Harada, T. Taniguchi, A. J. van Wijnen, J. L. Stein, G. S. Stein. 1998. Cell cycle regulation of histone H4 gene transcription requires the oncogenic factor IRF-2. J. Biol. Chem. 273:194. Jesse, T. L., R. LaChance, M. F. Iademarco, D. C. Dean. 1998. Interferon regulatory factor-2 is a transcriptional activator in muscle where it regulates expression of vascular cell adhesion molecule-1. J. Cell Biol. 140:1265. Xi, H., B. Goodwin, A. T. Shepherd, G. Blanck. 2001. Impaired class II transactivator expression in mice lacking interferon regulatory factor-2. Oncogene 20:4219. Matsuyama, T., T. Kimura, M. Kitagawa, K. Pfeffer, T. Kawakami, N. Watanabe, T. M. Kundig, R. Amakawa, K. Kishihara, A. Wakeham, et al 1993. Targeted disruption of IRF-1 or IRF-2 results in abnormal type I IFN gene induction and aberrant lymphocyte development. Cell 75:83. Lohoff, M., G. S. Duncan, D. Ferrick, H. W. Mittrucker, S. Bischof, S. Prechtl, M. Rollinghoff, E. Schmitt, A. Pahl, T. W. Mak. 2000. Deficiency in the transcription factor interferon regulatory factor (IRF)-2 leads to severely compromised development of natural killer and T helper type 1 cells. J. Exp. Med. 192:325. Stellacci, E., U. Testa, E. Petrucci, E. Benedetti, R. Orsatti, T. Feccia, M. Stafsnes, E. M. Coccia, G. Marziali, A. Battistini. 2004. Interferon regulatory factor-2 drives megakaryocytic differentiation. Biochem. J. 377:367. Yamamoto, H., M. S. Lamphier, T. Fujita, T. Taniguchi, H. Harada. 1994. The oncogenic transcription factor IRF-2 possesses a transcriptional repression and a latent activation domain. Oncogene 9:1423. Masumi, A., Y. Yamakawa, H. Fukazawa, K. Ozato, K. Komuro. 2003. Interferon regulatory factor-2 regulates cell growth through its acetylation. J. Biol. Chem. 278:25401. Masumi, A., K. Ozato. 2001. Coactivator p300 acetylates the interferon regulatory factor-2 in U937 cells following phorbol ester treatment. J. Biol. Chem. 276:20973. Staal, A., J. M. Enserink, J. L. Stein, G. S. Stein, A. J. van Wijnen. 2000. Molecular characterization of celtix-1, a bromodomain protein interacting with the transcription factor interferon regulatory factor 2. J. Cell. Physiol. 185:269.